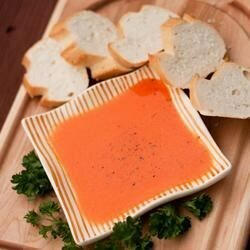 "Dipping fresh rolls or bread in this zesty oil makes a wonderful appetizer. It must be made at least 24 hours in advance." Place the olive oil and roasted red peppers in a blender, and blend until almost smooth. Strain through a fine mesh strainer lined with a double thickness of cheese cloth. Cover and chill in the refrigerator at least 24 hours before serving. A creamy hummus with a little cayenne kick. My husband and I really enjoyed this recipe - we added a bit of salt and pepper and we didn't strain it for more of a 'chunky' dip.